Winter woes have nestled in all of our homes. A great way to brighten our plates, palates, and homes are with easy one dish meals that offer hints of Spring, are delicious, healthy, and most importantly, crowd-pleasers. I love one pot/dish meals that can be assembled quickly with some pantry items paired with some comforting standbys. This dish works for larger families as well as for couples. My clients and my family love this dish. I hope you do too. I like to serve this dish with some couscous, but it is not necessary. Enjoy! Spring is right around the corner … soon, I hope. Preheat oven to 425°F. Toss beans and green olives in a 9”x13″ baking dish and spread out evenly on bottom of pan. Spread 1 tsp. mustard on skin of each chicken thigh and nestle, skin side up, into olives and beans. 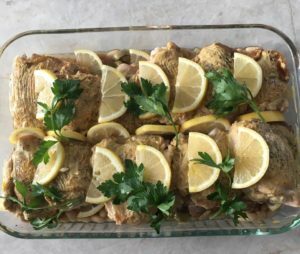 Arrange lemon slices under and around chicken and add enough chicken broth (about 1/2 cup) to come up sides of chicken by 1/2″. Drizzle chicken with Olive oil and season whole dish with salt and pepper. Roast chicken, stirring and shaking dish halfway through until skin is browned and an instant-read thermometer inserted into thickest part of chicken registers 165°F, about 35 minutes. If chicken skin starts to burn, move pan to a lower rack in the oven to finish cooking. Transfer chicken, beans, lemon slices, and capers to a serving platter. Spoon some of the pan sauce around chicken and sprinkle with parsley. NOTE: You can start this dish off by searing the chicken thighs in a pan with some olive oil first to get the skin nice and crisp. After that; spread the 1 tsp of mustard on each thigh and nestle skin side up into the 9”x 13” dish with olives and beans. This step is an option. It is an additional step that I do, to insure extra crispy chicken skin. However, even without the extra step, the chicken skin gets a beautiful golden hue in roasting.